Some of today's offerings at the Avenue du Président Wilson market. Recently I was watching an episode of Laura Calder's "French Food at Home" on the new Cooking Channel in which Laura served an assortment of artisanal tinned sardines, with wonderful French bread and butter, as an appetizer. This really appealed to me (but not to my wife, who was forced to eat sardines as a child and still harbors a grudge), and I vowed to myself to follow up. The show included a visit by Laura to the little shop in Paris where she had found the exotic assortment, but without giving the name. I wrote to Laura, who kindly informed me that the shop is La Petite Chaloupe, 7 rue du Pont Royal, Paris 13ème. This unique shop was my first stop on arriving in Paris earlier this week. They have dozens of kinds of sardines, all French and almost all millésimé (like vintage wines), with various spice profiles and packed in different oils. 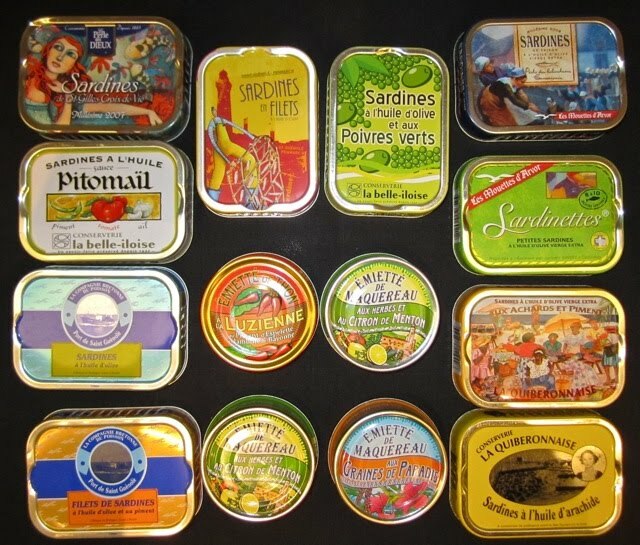 Also many other tinned fish products - tuna, mackerel, anchovies, etc. - of the highest quality. Needless to say, I bought a selection (pictured below) to bring back to New York, to eat myself or to share with friends. Next time you're in Paris, I recommend a visit. 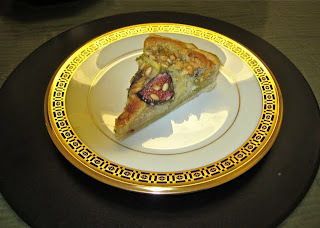 Quick - While You Can Still Get Fresh Figs . . .
. . . make this wonderful Fig and Almond Tart from the excellent blog "Lunch in Paris." It is easy and, as noted in the blog, the frangipane is light and therefore doesn't overwhelm the delicate figs. Del Posto - The Best Restaurant in New York? My wife and I had the good fortune to celebrate her birthday at Del Posto a few days ago. I had made the reservation before The New York Times awarded the restaurant its fourth star, although our dinner followed the article in the Times. We loved it last year and it has only gotten better: the four stars are richly deserved. Not only is the very innovative Italian food excellent, but the room is beautifully designed and not densely packed and the staff are capable and welcoming. Given severe recent disappointments at Jean-Georges and Le Bernardin - our former favorites - Del Posto is now our number one New York dining destination. I don't really review New York restaurants because there is more than enough information available to US readers, but this is a noteworthy restaurant that is worth the trip to 10th Avenue and 15th Street.